Stop 4: Freakin’ Frog’s. Nestled in a strip mall a couple miles off the strip and just across the street from UNLV, almost hidden, is a little bar. A very special little bar to be sure. Friday night, Ginger wasn’t feeling all that great and wasn’t of a mind to explore and was considering a nap so I struck out on my own. I walked right up to the front of the Trop and hopped in a cab and asked him to take me to Freakin’ Frog’s on Maryland Blvd. He had no idea where it was. I said the major cross streets were Tropicana and Maryland and if he’d start off I’d pull the addy from the web. He dropped me off in this dingy little strip mall (after passing the place up and having to make an illegal U-ie to get me there) and (despite feeling a bit uncomfortable on the inside) I girded up my loins and put on a smiling mask to the tatted up bouncer and full of 3DC confidence walked on into the bar. It was soul music night and the place was about 3/4 full locals as the show was just getting started I slipped in pretty well unnoticed. This place was definitely a toss back to the 70’s. I noted a set of stairs that (very non fung sui) lead straight up to what looked like an office / store room excepting the fact that there was this old set of theater line poles and a dingy padded rope hung between them barring access to them. The bar itself might as well have been a biker bar, save the clientele was a fairly well mixed set of locals. The bar staff looked pretty tough too, though most seemed on the other side of questionable decisions one might make in one’s youth. I slid down tot he end of the bar by the stairs and asked if there was any way I might be allowed a peak at the Whisky Attic. The barman said I’d need to talk to Adam about that but he didn’t think they were taking anyone up there tonight. He said he’d ask though. He went out and talked to a guy clearing tables and generally being the kind of active engaged manager I can appreciate. He returned and said if I’d wait, Adam would take me up in 10 minutes or so after the room was set for the show. About half way through the first song. Adam walked on over and said “let’s go”, dropped the rope at the bottom of the stairs and we climbed on up. The room at the top of the stairs was about 15′ X 40′ with a table and chairs to the left and a bar about sectioning off about a third of the room to the right. On the far wall and all the walls beyond the bar were oak shelves. On these shelves were bottle after bottle of different expressions. 750 or so Adam told me and he indicated he had another 300 hundred or so in the office he’d not yet been able to shelf. I asked if I could take pics and he said I could, though in hind sight I think I only took 3 pics in total, so awe struck was I by the selection all around me. He invited me back behind the bar to get a better look at it all as we talked about the 3DC and what his goals were for this collection. I’m not going to go into all that we spoke of, you’ll just need to go talk to the man himself to get all the details. After looking about and reeling from the realization that I was amongst several hundred drams I’ve never had, I noted a selection from the same distiller / bottler from India and he said he had a special on those, a flight of them for $100. I think I said, “let’s do it”. He then said he intended to change the way I tasted whiskies. Adam, you see, is a professor over at UNLV as his day job and has spent a significant amount of time thinking about the subject. His rationale is that the reason we look, smell, then taste harkens back to our caveman days when we were just trying to suss out whether or not what we were about to ingest was poisonous and that the fact that we acknowledge that he was not intending on killing me and that mankind has thousands of years evolving since those times that perhaps there may be a better way to go about such things. I encourage each of you reading this and that have even a passing interest in whiskies to go and meet and learn from this man on your own or in groups as your druthers dictate, but do so. I don’t expect to be able to do justice to describing his method of tasting, but I will say it works better for me than the 3 or 4 methods I’ve used to date. That and I intend to be using as my primary technique going forward. If you hit me up in person, I might be able to show you, but I don’t have the words to put it to paper so you’ll have to be content with this much. The flight was 6 bottles from Amrut and we’re all pretty darn spectacular. 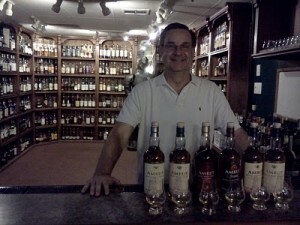 (I’ve found out that since March some of these drams have started making their way onto American shelves.) I’d heard so many bad things about Indian Whiskey that admittedly my expectations were pretty low, but there was no need for that. 2 were cask strength and 1 of those and 1 other were peated as well. Not a bad dram in the bunch. By reservation only, call 702-217-6794 to speak with Adam B Carmer and make an appointment. This entry was posted in Misc. 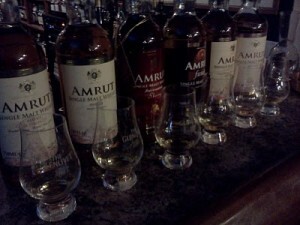 News, Miscellany and tagged amrut, Frickin' Frog, Las Vegas, whisky bars. Bookmark the permalink. Sounds like my first visit to the Attic. Apprehension followed by awe. Great experience and Adam has a wealth of knowledge to share. Sounds like you had a great trip!